New Event Dates, Fresh Food Access and More! Manchester Street Park to help plant 200 perennials, remove invasive weeds and debris as well as weed the community garden. Thanks to a great effort with real results! In order to continue our work improving open green space in Lawrence, we have teamed up with the prestigious Cornell Lab of Ornithology on their Celebrate Urban Birds Program. 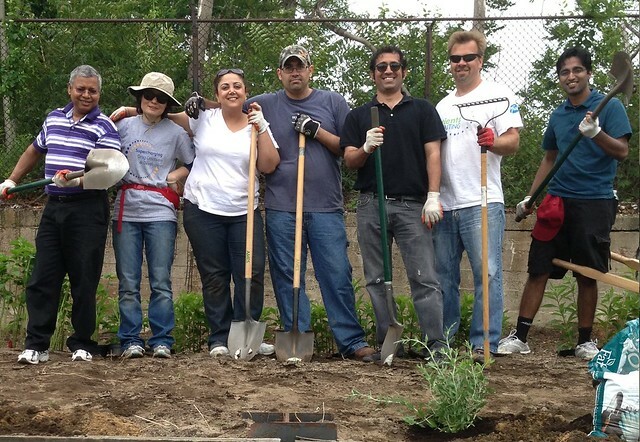 Our project has been focused on Manchester Street Park, and is helping to make some exciting improvements there! 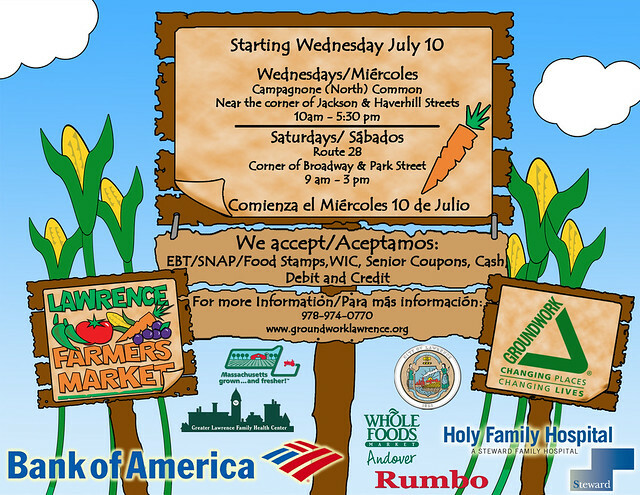 Farmers Markets to Open Wednesday July 10 and Saturday July 13! NEW LOCATIONS! Come join us in opening the Lawrence Farmers Markets to kick off a wonderful season of fresh local food, cooking demonstrations, music, entertainment and lots more! We have relocated our markets so to enjoy fresh produce and fun on Wednesdays, please join us at the Campognone (North) Common from 10 am - 5:30 pm and on Saturday at the corner of Broadway and Park Street from 9 am - 3 pm! Details below! We wish to give a special thanks to our lead sponsor, Bank of America as well as Holy Family Hospital, Rumbo, Greater Lawrence Family Health Center, Whole Foods Andover and of course, our partner, the City of Lawrence. We hope to see you there on our opening days and throughout the season! 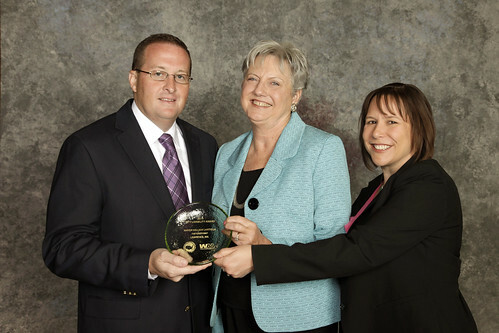 Winners at Annual Meeting in Las Vegas, Saturday, June 21 to Monday, June 24. Honorable Mention citations for cities with populations of less than 100,000 went to Lawrence (MA), Mayor Sumter (SC), Sunrise (FL), and Turlock (CA). 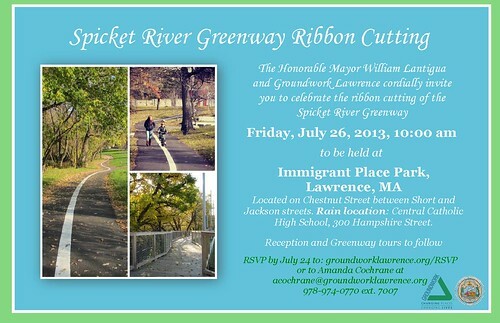 Please join us to celebrate the accomplishment of the Spicket River Greenway at our rescheduled Spicket River Ribbon Cutting on July 26, 2013 at 10 am. RSVP Here. Details below. As part of our mission, we strive to make high-quality fresh produce accessible to as many members of our community as we can. Groundwork Share-a-Share™ donations are used to subsidize the cost of fresh food through subsidized CSA shares, incentive programs for our Farmers Markets, Fruit and Vegetable Prescriptions (FVRx), and fresh food donations to food pantries. Through our Groundwork Share-a-Share™ Program, you can make a tax-deductable donation to help us extend the benefits of fresh, locally grown food to those who would otherwise not be able to afford it. Your donation in the 2013 season is particularly crucial because our primary FVRx foundation funder is unable to support our program this year. This means that without your donation, we will be unable to help a significant number of low-income families who suffer from diet-related health disparities afford fresh produce.Help us meet our goal--we are almost there! Thank you in advance for considering a donation to Share-a-Share!